No matter whether you are a side sleeper, back sleeper or stomach sleeper, Casper undoubtedly offers first class sleeping experience to everyone alike, supporting every sleeping posture of yours. Wondering how? Well, made from 4 different layers, the third “poly foam” layer is the real game changer for Casper and perhaps the first of its kind design in mattresses segment. Divided into two distinct halves, this layer is made from two different materials, while soft foam is on top i.e. around shoulders section and firm foam is placed around hips and back, as these areas put more pressure and often result in deep sinking. Casper termed it as “zoned support”, meaning two different materials stitched within the same layer but offering varied firmness so as to absorb and distribute body weight evenly. Following is a quick snapshot at Casper Sleep mattress’ layer construction. Latex foams are known in the industry for their plush and bouncy feel. The comfort of sleeping on a memory foam mattress is justified when you have latex foam as the topmost layer. However, the side of the story being that latex is too plush and people with slightly heavy personality might find to getting stuck in this foam. However, Casper has tweaked this latex foam to come up with its own proprietary foam that carries the bounce of a latex foam yet provides the support of a visco-elastic foam. Such proprietary foam is again seen Tuft and Needle mattress. Even more, due the porous structure of this layer, the top surface remains always cool and moisture free. Other regular memory foam mattresses (with no a gel infused top layer) tend to heat up the sleeping surface owing to closed porous cell structure. Anyways, in case of Casper mattress, the top layer absorbs and moves heat away from sleeping surface, as shown the graphic below. The second layer in Casper mattress is made from memory foam. This layer is what aligns with your body curvature at critical points like shoulders, hips and lower back. If the top proprietary layer offers plush feel then this intermediary memory foam layer offers body countering. As mentioned in the introduction, the design of this layer is the real game changer for Casper mattress. Casper has meticulously divided this 2 inch transition layer into two halves. And two different foams with distinct firmness levels are employed in making this layer. The portion from hips to head section is made from soft poly foam. However, the layer from hips to toes is relatively firmer than the top section. The reason being that hips and lower back are the only areas which apply maximum pressure on the mattress. And if this portion is too soft then that is when you get a feeling that you are getting stuck into the mattress. Hence, Casper has come up with this innovative layer design with varying firmness levels. And again, like in all mattresses the base layer is made of high density foam. This 10 inch Casper mattress has a 5 inch thick base support layer. Made from soft polyester, the cover comes with a zipper making it easy to remove and wash.
On a scale of 1 to 10, Casper’s firmness stands at 6.5. Most other mattresses prefer to offer a firmness level of 6 so as to cater to a wide range of audience. But one thing we have to keep in mind is that the overall size of this Casper mattress is 10 inches. Hence, Casper has ideally selected the firmness level at 6.5 as this score perfectly fits even people who are slightly on the heavier side. Firmness level is indirectly proportional to motion isolation. Higher the firmness, less shall be motion disturbances. And in Casper mattress, the top 2 inch latex mattress is the only layer that sinks with weight. The intermediary layers, both memory foam and poly foam, offer body contouring and support. There is no chance of you sinking deep into the mattress unless you intentionally apply pressure or jump on the mattress. But rolling or moving while asleep will surely not disturb your sleeping partner. In any case, the sink shall not be more than 3 inches for average to slightly above weight people and even the radius of impact shall no more than 3 to 4 inches. This means the impact won’t really effect your sleeping partner. 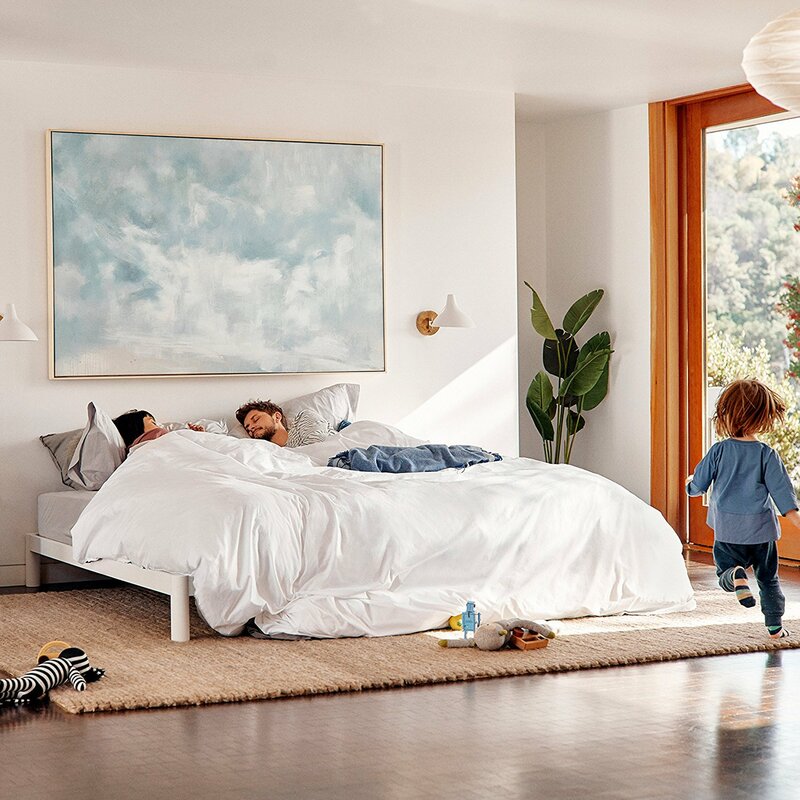 When it comes to edge support, you can conveniently bet that Casper’s performance is far better and impressive than most other 10 inch and 12 inch mattresses. Apart from the top proprietary layer, the remaining 3 layers hold the mattress from sinking deep even on the edges. But remember no memory foam mattress supports you if you are intentionally sleeping on the edges to test whether you are going to slip downwards or not. Smell is an innate problem with all memory foam mattresses and Casper too is no exception to it. However, the best way to get rid of this smell is to leave to for full 72 hours for expansion. During this time it is always advised to not the mattress by sitting or sleeping on it. 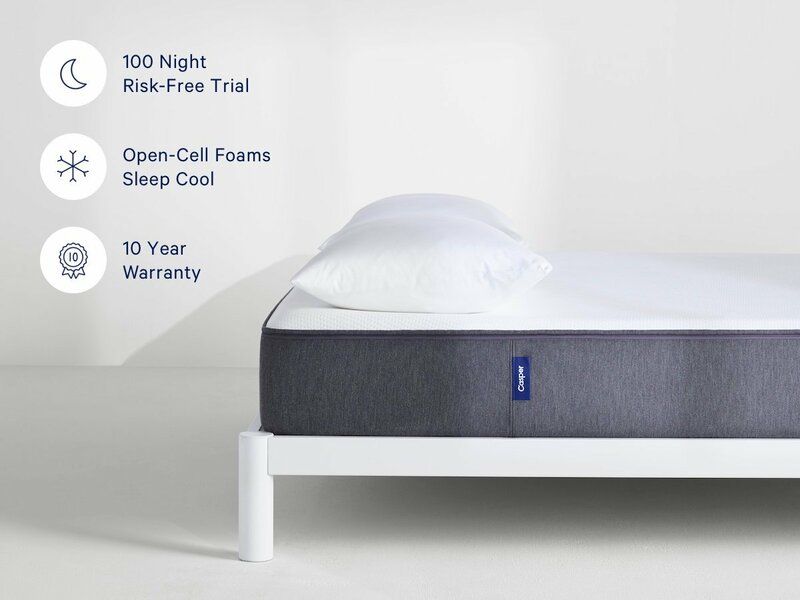 One another unique selling point is Casper offering 100 night trial for this mattress. And like in case with all Casper mattresses, even this one comes with 10-Year warranty. Casper Mattress is perhaps the only mattress that absorbs weights evenly across the entire mattress surface. While most other mattress definitely sink more around waistline but keep the rest of the body floating, it does seem to be uneven sleeping surface. Whereas, in case of Casper mattress, owing to the third layer’s “zoned support”, the mattress offers perfect even sleeping surface with weight distributed equally from top to bottom. Even more, the top layer made from proprietary latex foam is porous in nature and keeps the sleeping surface relatively cool.